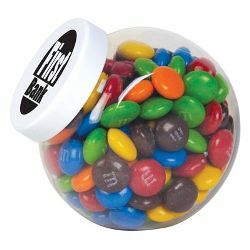 145 grams of milk chocolate M&M's packed in Container. Finished weight - 180 grams. ITEM SIZE(MM) 85L x 77H x 58D. PRINT AREA(MM) Pad Printed - 39 Diameter, 4CP Standard Label - Up to 45 Diameter (choice of lid or side). LABEL SIZE (MM) 45 Diameter. MATERIALS Container - Clear Food grade PVC, Lid - White P.E.